The Public Works Department takes great pride and hours of hard work to maintain the miles of streets, sanitary sewer lines, storm sewer lines, and various Borough owned properties, for the highest level of safety for the residents and visitors of Somerset Borough. Before you call a plumber if your main sanitary sewer line from your house is clogged, call the Borough at 443-2661 Monday through Friday 8:00 a.m.— 4:30 p.m., evenings and weekends call County Control at 445-1525. If you experience low water pressure, call the Borough at 443-2661 Monday through Friday 8:00 a.m.— 4:30 p.m. This could be caused by a water break or a problem in your house that the Borough can inform you that you need to contact a plumber. Approximately two weeks are utilized in October to pick up the resident’s properly marked leaves. The Borough has a drop off site also at the Public Works Garage for leaves and grass clippings. We also have made provisions for when you empty your bags please throw your empty bags in the cans provided. The Public Works Department helps with several Borough and non-Borough festival set up such as Fire & Ice, Christmas Lights and Christmas Tree, and East End-Ribs, Run and Family Fun. After the winter plowing season, the Public Works Department does go around and landscape and reseed areas that the plows may have damaged. Also, there are at different areas that the Public Works Department regularly mow and trim the grass. Pretreatment is the policy set forth that prevents users from discharging pollutants into the sewer that will not meet all applicable state and federal laws, including the Clean Water Act. Duties include the industrial users sampling their discharge on a monthly basis. Any violations of significant industrial users permit can result in a fine for non-compliance of the permit. The Borough inspects grease traps at 41 locations each month. We also recheck 14 locations along the 601 and Pleasant Avenue trunk line a second time each month. The Borough also samples the industrial pretreatment users twice a year and work with the users to work out any problems they may have in their program. There are approximately 41 miles of sanitary sewer mains line from 8” to 24” in diameter. The Department is also responsible for the signs throughout the Borough limits. This includes signs that are missing, damaged, or have graffiti on them. If you see such signs, please call the office at 443-2661. The date and areas are yet to be determined. There are twenty-three miles of Borough maintained streets that the Public Works Department try to keep in the very best condition. Potholes are patched as quick as possible when found. 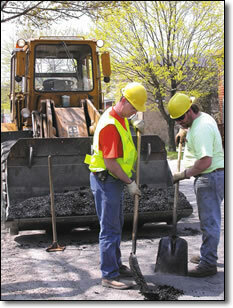 If you know of a pothole that needs patched, call the office at 443-2661. The Department tries to maintain the highest level of safety for the residents with the painting of curbs, crosswalks, and stop bars, which is done on an annual basis. This is done throughout the year, mainly in the spring, summer, fall, and occasionally during the winter months. There are approximately 35 miles of storm sewer lines ranging from 8” to 36” in diameter. There are 550 catch basins. Even though most of the traffic lights in the Borough are on state roads, the Borough is responsible for the maintenance of the traffic lights. There are daily inspections to see if all of the lights are working properly. To report lights that are out or malfunctioning, call the office at 443-2661. Distribution duties include repair water lines when needed, install new water lines, and repair/install water meters. The types of specialized equipment used are lab testing, line locaters, Backhoe, Dump truck, Taping Machines, and a pipe freezer. The size and types of pipes and valves used are 3/4” up to 16” Cast Iron, Ductile, and plastic.